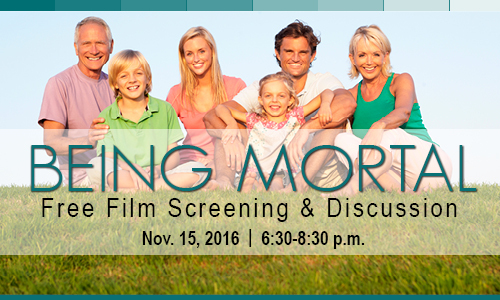 The community is invited to attend a free screening of the documentary “Being Mortal” on Nov. 15, 2016, from 6:30-8:30 p.m. at Dakota Medical Foundation located at 4141 28th Ave. S. in Fargo. This event is free, but pre-registration is required by Nov. 8 because seating is limited. Register at http://bit.ly/beingmortalfargo or call (701) 356-1521 to reserve your seat. After the screening, you can participate in a guided conversation on how to take concrete steps to identify and communicate wishes about end-of-life goals and preferences. The discussion features Dr. Tricia Langlois with Hospice of the Red River Valley, Dr. Steven Briggs with Sanford Health and Dr. Walter Johnson with Essentia Health. The Emmy-nominated documentary, “Being Mortal,” delves into the hopes of patients and families facing terminal illness. The film investigates the practice of caring for the dying and explores the relationships between patients and their doctors. It follows a surgeon, Dr. Atul Gawande, as he shares stories from the people and families he encounters. When Dr. Gawande’s own father gets cancer, his search for answers about how best to care for the dying becomes a personal quest. The film sheds light on how a medical system focused on a cure often leaves out the sensitive conversations that need to happen so a patient’s true wishes can be known and honored at the end.